Beware of the Love Bugs! they are making their debut. and are of course incredibly cute. that they don't give you a buggy kiss. that we had on hand to make their love bugs. the rest was left completely up to them. based on what we had on hand & then got creative. She was in full "concentration" mode. Of course I mean both of them! 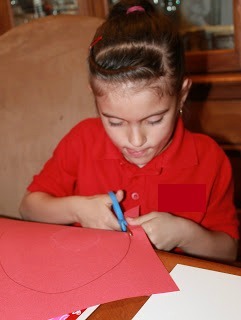 she got some good cutting practice with this activity. She is trying to master making hearts at the moment. 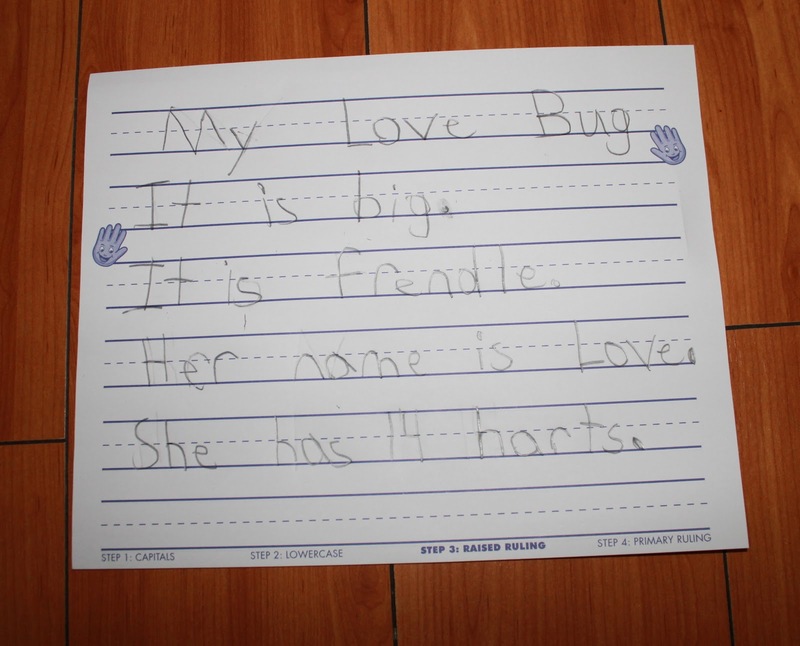 to reinforce/practice her writing & spelling skills. 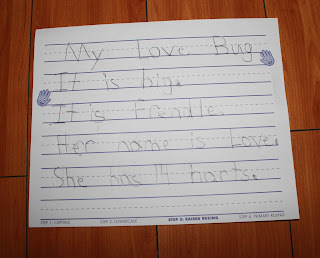 We worked on using proper handwriting, correct sentence formation and phonetic spelling of any words she did not know. & her writing has come a long way. These little guys are just too cute! 1. Use large pom pom balls for the body. 3. 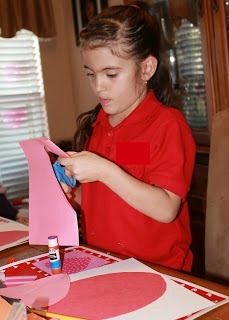 Cut out a heart shape from foam for the feet. 4. Add pipe cleaner antennas & a foam mouth. 5. After some drying time - go ahead & play! You won't be able to resist these little guys! Very cute love bugs! Great idea for a writing project too. These turned out soo cute! 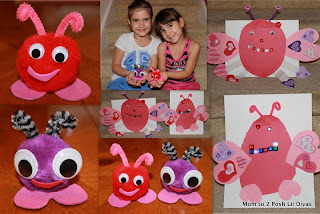 Very cute Valentine crafts. Those Love Bugs are adorable! Awesome idea! just saw this idea on pinterest...can't wait to craft with my kids! Hi Kristi! Thanks for joining us! So excited to have you here! :) Don't you just love how we can share on pinterest! SOOOOOO cute! And to use the bugs as a writing prompt? Genius! I love this!! Thanks (as always) for sharing your amazing ideas. Your girls are SO lucky to have such a fun and creative mom! 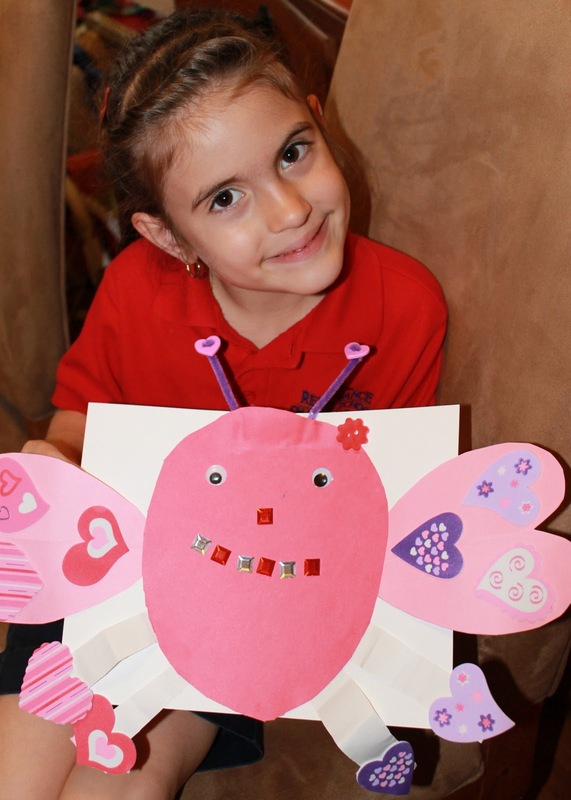 Such cute crafts, I love the writing activity too. I love to watch them sound out words phonetically and see them transfer onto paper. Thanks for sharing on Monday Madness. Both are such cute ideas! They so cute! Now I want a love bug! These are too cute! I've pinned this great idea on Pinterest! Thanks for sharing! So cute!! It looks like they had a lot of fun making them as well. Thank you for sharing at Sharing Saturday!! Have a wonderful week! Very cute, when I saw this a few days ago I went in search of Large pom poms. We are making ours tomorrow. Unfortunately I was only able to find Large Red pom poms but since it is Valentines day think it will be fine. Thanks for sharing. how do you get the pipe cleaners to stay on the top of the pom poms? Just glue? Did you have to use hot glue? we used glue-all but since we cut the pipe cleaners & a bit of the wire was exposed I also stuck them in a bit and that helped them stay put. Hot glue would also do the trick though.